UN Security Council members met Saturday to discuss the situation in Syria. UNITED NATIONS — The UN Security Council overwhelmingly rejected a Russian resolution calling for condemnation of ‘‘aggression’’ by the United States, United Kingdom, and France against Syria on Saturday, a vote reflecting support for the allied airstrikes on Syrian chemical sites. But the vote at the end of an emergency meeting called by Russia also demonstrated again the paralysis of the UN’s most powerful body in dealing with Syria’s seven-year conflict. 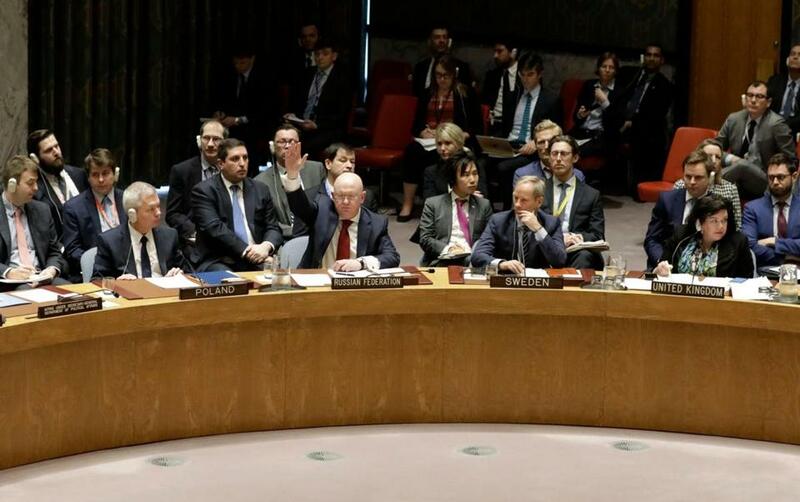 Russia’s demand for condemnation and an immediate halt to ‘‘aggression’’ and ‘‘any further use of force’’ by the three Western allies got support from only two other countries on the 15-member Security Council: China and Bolivia. By contrast, eight countries voted against the Russian draft — the US, UK, France, Netherlands, Sweden, Kuwait, Poland, and Ivory Coast. Four countries abstained: Ethiopia, Kazakhstan, Equatorial Guinea, and Peru. At the meeting, the fifth in a week on chemical weapons in Syria, Russia and its supporters again clashed with the US and its allies over a suspected poison gas attack on April 7 in the Damascus suburb of Douma. The US, UK, and France said they launched airstrikes against Syrian chemical sites after obtaining evidence that a chemical weapon was used by President Bashar Assad’s government. Russia and its ally Syria called the attack fabricated and said no evidence of chemical weapons use exists in Douma. And she said President Trump told her Saturday morning that if the Syrian regime uses poisonous gas again ‘‘the United States is locked and loaded’’ to strike again. Britain believes ‘‘that is wholly within the principles and practices of the United Nations,’’ she said. ‘‘I would like to believe that we will not see a day that is worse than today,’’ he said. Looking ahead, Delattre said France, Britain, and the United States will soon be presenting the Security Council with a new draft resolution aimed at achieving a lasting solution to the Syrian conflict that addresses political, chemical and humanitarian issues. A draft resolution circulated by the three countries and obtained late Saturday by the Associated Press would condemn all use of chemical weapons, especially the April 7 attack in Douma. It seeks answers from Syria on gaps in its chemical weapons declaration to the Organization for the Prohibition of Chemical Weapons. And it would establish a body to determine responsibility for chemical attacks, call for a cease-fire in Syria, unimpeded access for all humanitarian aid, and an urgent resumption of negotiations on a political settlement. Nebenzia responded saying the environment is ‘‘not very conducive for any rapprochement’’ and ‘‘the political and dangerous military situation we are in now’’ must be sorted out first. ‘‘Once again, we demand an immediate stop to aggression and refrain from the illegal use of force in the future,’’ he said. UN Secretary-General Antonio Guterres, who briefed the council before the vote, stressed again ‘‘the need to avoid the situation from spiraling out of control’’ and for a political solution.